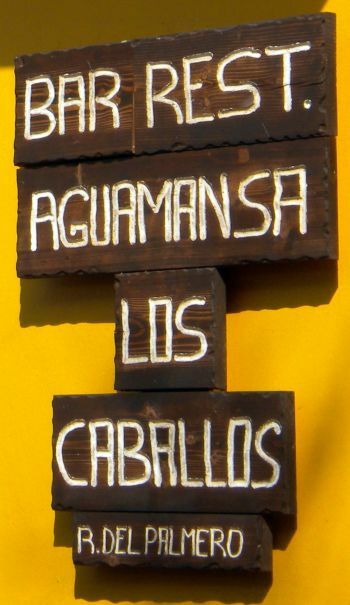 The Restaurante Aguamansa Los Caballos, as per latest name change has been a popular place for a long time. However, it's now a steak house, since the nearby trout farm has been closed by the Government for health reasons. In December 2015, this eating place celebrated its thirty fifth anniversary. 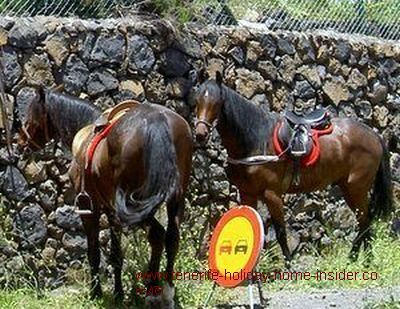 It has served tourists and locals of the area which is a prime horse(caballo)and farming community. Therefor, Los caballos is part of its name now. Look out for the last restaurant on that road. Alternatively, mind the Titsa bus 348 stops. 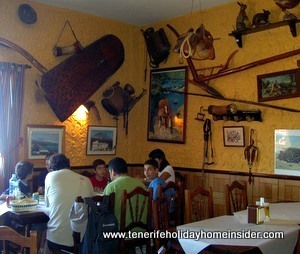 Later we learned that our trout restaurant had in fact been a kind of a Tenerife halfway house for riders of the region for a long time. That's how it's stood its test of time. 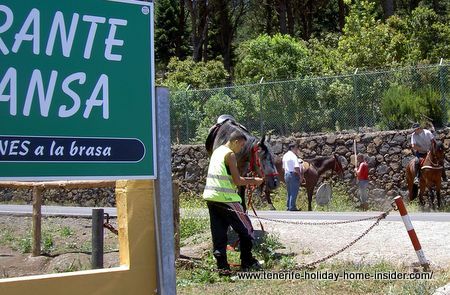 There even is a horse parking spot opposite the restaurant as is also customary in the Aguamansa forest. Riders arrived and secured their horses by holsters at the strong iron rings. They are features of the wall of natural stones by the road opposite the restaurant. This was by the advertisement board which read 'Restaurante Aguamansa and Specialidad Carnes a la braza'. The latter means grilled meats. Obviously, trouts were part of it. The former trout restaurant has a country inn rural dining room. Normally, every man is a hunter in this region. Hunting trophies and their parafinalia are proudly displayed on the terracotta colored walls together with paintings that match the sport. What's on the menu besides trout? Pork chops are classics, but are usually a la plancha which means done on hot stones or metal in this case. French fries, or Papas arrugadas with red and green Mojo sauces are standards. So is fresh local goat cheese or a cured version. However, fresh trout had been recommended to us mostly. The Restaurante Aguamansa has a fairly long l-shaped outside veranda. There, most of the red plastic chairs, tables and umbrellas were occupied by merrily chatting riders. We opted for rustic wooden benches and tables. They were further away in the semi shade of a large tree. 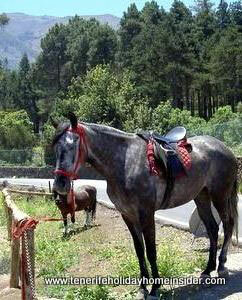 We watched the quiet Tenerife horses, while waiting for our fish. There must have been space to attach about 25 horses to the wall by the reins. This is to judge by a photo I have from another such wall. All in all there were only about 7 or 8 animals parked off, besides the grazing foal with its mother. Why I mention this? It shows the importance of the Restaurant Restaurante Aguamansa. The waitress was the only woman around, except at a later stage when two were there. What about our trout at Restaurante Aguamansa? 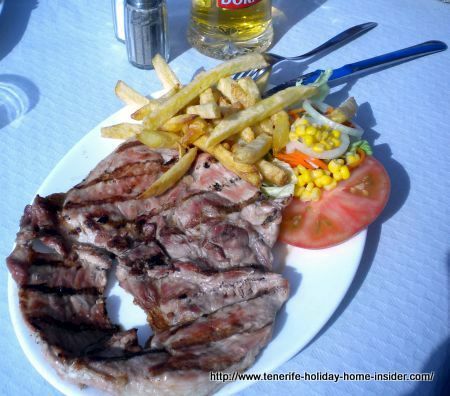 Our trout arrived together with French fries and the regular mixed salad that's normally served in Tenerife bars. Just some lattice, onion rings and a few sliced tomatoes... But the fish was huge and very good, although a little burned on its shoulders. By the way, we had Barraquito coffees for dessert which tasted pretty good. Where is the trout dish photo? My friend Guenther took a photo with the fish and me but I don't like it. Don't ask. Almost all tables outside were taken by German hikers when i passed by with a friend. Many were waiting later at the Titsa bus station close by. Some only took drinks. Therefor, the addition of the word bar became important. There were many cars parked which we could see from our table. My friend ordered grilled pork. He liked its slightly smoky taste. A huge quantity of meat... He much appreciated the Mojo Picon the hot chilly sauce that was served to both of us. Grilled trout with potatoes and salad. Again, I ordered fresh grilled trout. I received two fish. A huge portion like my friend's. Then, there were Papas Arrugadas which were white inside, hence no Bonitas. The usual salad on the side. So how was it? Fresh but a bit blunt, I must confess. Somebody told me later that a slice of bacon inside would make all the difference. Anyway, the hot sauce spiced it. Definitely not gourmet food, but healthy as opposed to fast food. Indeed there was no problems with the goodness of the fish, in those days. The price of our meals which included drinks had not gone up since my first stopover in 2009. I had white house wine which tasted pretty good. My friend felt like a normal beer. The trout fish was only €6,70 at that time. My friend's dish was also cheap. Amazingly economical which may be due to a bigger turnover. The waitress told me that attendance in the rest of the year was just as good now. Why not buy fish at the nearby trout farm? A friend once mentioned that fresh trouts there are not cheap, unless one would buy a large amount. Hence, it was a good idea to eat it at the restaurant. By the way, I haven't seen trout fish for sale at Mercadona in the last years. Perhaps, the restaurant was an exclusive customer in the end. Call Restaurante Aguamansa at tel. 922 330638 to make sure it is open. I would think it is, as it's in such high demand nowadays. 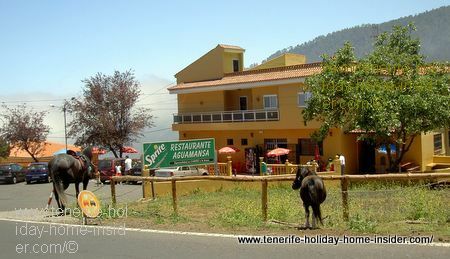 Generally, restaurants of Tenerife are closed after the Sunday lunch and sometimes on Mondays. The Tenerife fish farm Aguamansa whose trouts were served in the eating place by the same name. 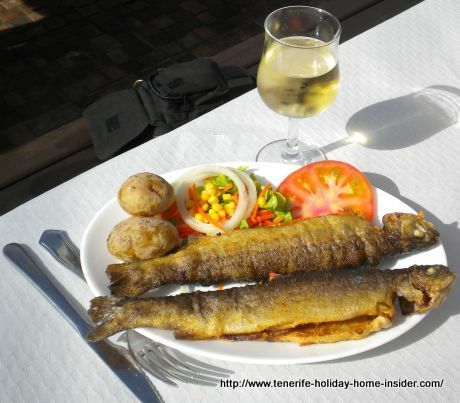 Sample more fish by going out to Restaurante Tambo of Tenerife. Mind under new management now.